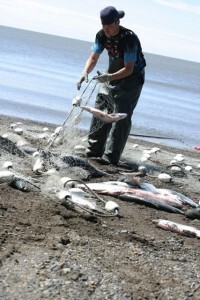 The Shore Fishery Lease Grant was created to enhance income potential and allow for some certainty of access to a site for resident Bristol Bay setnet permit holders by providing eligible participants with financial assistance toward gaining a State of Alaska Shore Fishery Lease. Residents of the 17 BBEDC communities that meet program requirements may qualify for a one-time BBEDC grant of up to $800(or no more than 75% of the total cost) for a State of Alaska Shore Fishery Lease. Please see the Shore Fishery Lease Fact Sheet for more information and/or contact Massa Pat or Alice Ruby at 842-4370 or 1-800-478-4370.